Ok ok, I apologize for the Star Trek joke, but there just isn’t that much biscotti related humor out there. Today I’m going to share a recipe for low carb cranberry biscotti with a coconut and chocolate drizzle. And I have to tell you, this dessert is just as good as it sounds. It’s a total yum. To make these Italian cookies, you start by mixing up a dough of almond flour, coconut flour, eggs, baking soda, vanilla extract, unsweetened dried cranberries and sugar-free sweetener. You form the dough into a rectangle and bake it for 20 minutes, then let it cool to room temperature. This is the first step you take to dry this cookies out. You cut the rectangle up and bake the pieces again for 20 minutes more. Then you allow the cookies to come up to room temperature in the warm oven. This really dries the cookies out and gives them that crunchy biscotti texture. To finish the biscotti off, you spread some sweetened coconut butter on top and then drizzle chocolate on top of that. And next thing you know, it’s “Beam me up Biscotti” time. These Low Carb Cranberry Biscotti are dense, crunchy and delicious. And each cookie has just 6g net carbs. 5. Stir in the dried cranberries. 12. 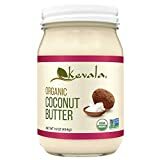 Microwave the coconut butter in a small microwave safe bowl until melted, 90-120 seconds. Mix in powdered sweetener. 13. Use a knife to cover one side of the cookies with coconut butter. Place in the freezer for 10 minutes to harden the coconut butter. 14. Microwave the chocolate chips and coconut oil in a small microwave safe bowl until melted, 60-90 second. Stir well to combine. 15. Drizzle chocolate over cookies and place in the freezer for 10 minutes to harden. If you liked this recipe for low carb biscotti, then you might like my recipes for Chocolate Pistachio Biscotti, Almond and Chocolate Biscotti or Almond Crescent Cookies. Biscotti?! Enough said, I’m in!!! These look delicious! Thanks! They really are quite tasty, if I do say. I love chocolate and coconut together and these look incredible. Beam me up, for sure! These look like a tasty afternoon treat or even a yummy breakfast. Can’t wait to try them! Yay! Let me know how you like it. I love your recipes so it means a lot. Why I’ve never made biscotti yet. They look so good! Thanks! They take some time to make, but it’s worth it for real low carb biscotti. I am seriously so excited to try these out. they look incredible!